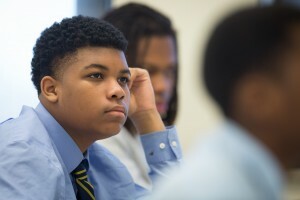 Thank you for taking the time to consider the ways in which you can help Chicago Jesuit Academy remain a reality for students on the West Side of Chicago. We are always looking to share our work with people who want to learn more about our school. The success of our mission depends entirely on the generosity of individuals who believe in the promise of our students and alumni – people who believe that the cycle of poverty can be broken through education. Invest a financial and/or in-kind gift. Make a scholarship pledge in support of our students. Help leave a legacy for our students through planned gifts. Provide an item on our Wish List. Contribute your time or your expertise as a Volunteer. Join our mailing list and “Like” us on Facebook. All gifts, regardless of type and size, are critical investments in support of our students and the development of our school. Without the support of our friends and benefactors, we would not be able to educate our students. If you have questions about making a gift to Chicago Jesuit Academy, please contact Danielle Pernini, Director of Development Operations, at (773) 638-6103 ext. 2333 or by email at pernini@cjacademy.org.Thank you again for believing in the promise of our students and alumni.